I could write 5,000 words on this page. But I won’t. Just know that Calvin’s first “real mountain” was pretty much everything I could have dreamed it would be for him. Why? Because he loved it. I must admit, this shocked me a little bit. 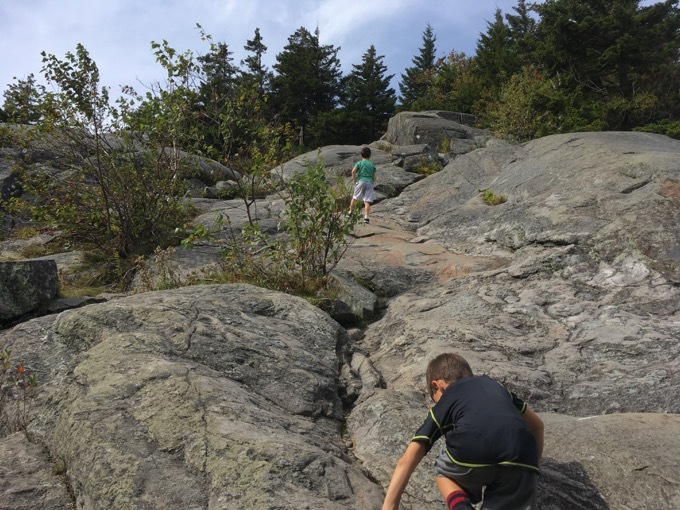 Monadnock (via the classic White Dot Trail) is not easy for a six-year-old. 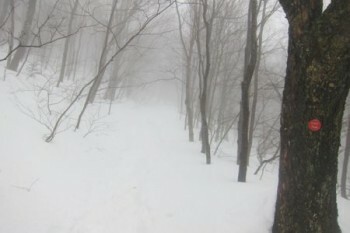 It’s 1.8 miles is very steep and unrelenting. It simply goes up from the get-go and never really stops until the summit. My plan to have one of Calvin’s buddies and his dad come with us seemed to work to perfection. 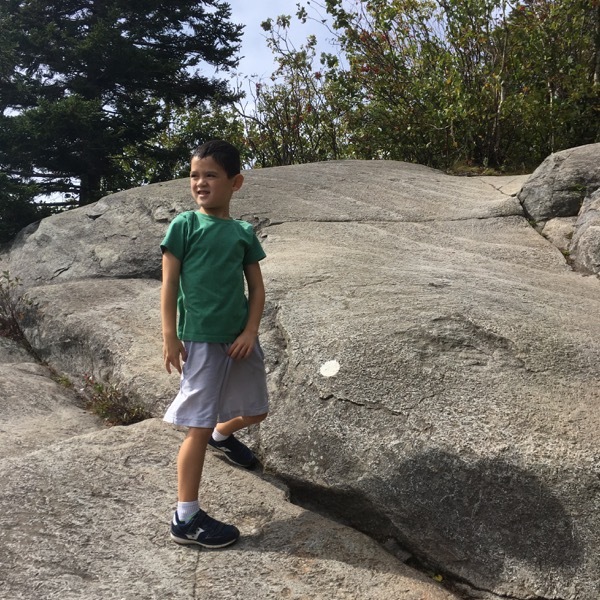 Sean (the dad) is a fellow experienced hiker and Owen (the son) and Calvin are adventurous little boys. There were a couple very mild complaints early on; while still amongst the tall trees. 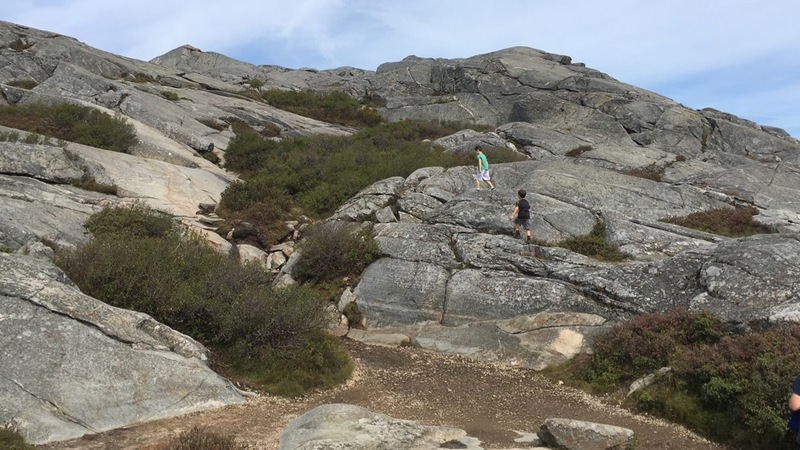 But once we reached the first exposed rock and expansive views east, the boys were off and running. Literally running. 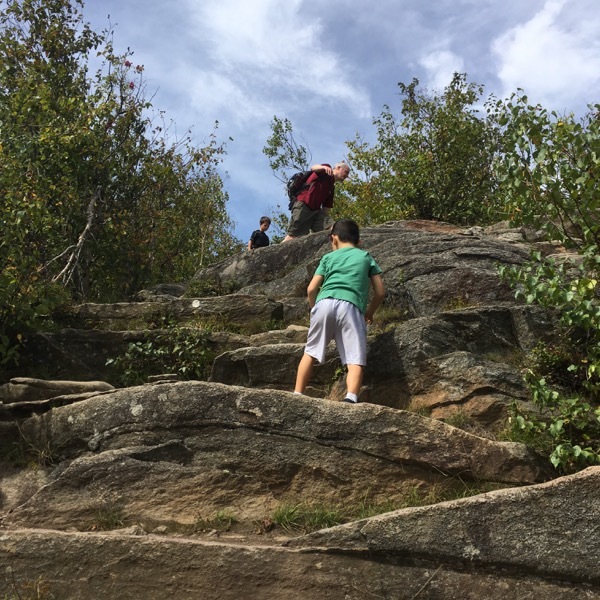 Up Monadnock. Up rock scrambles and cliffs. Sean and I had to keep reminding/begging them to slow down. 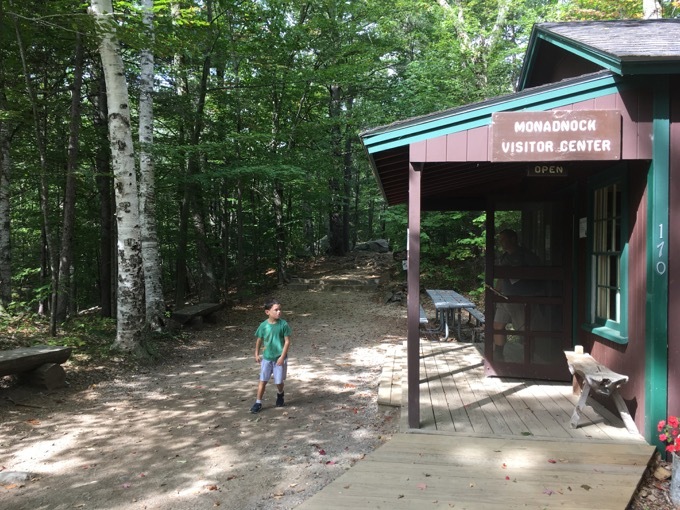 Monadnock features in countless books and stories in New England and beyond. It truly is a special mountain. Ralph Waldo Emerson and Henry David Thoreau waxed poetic about it. 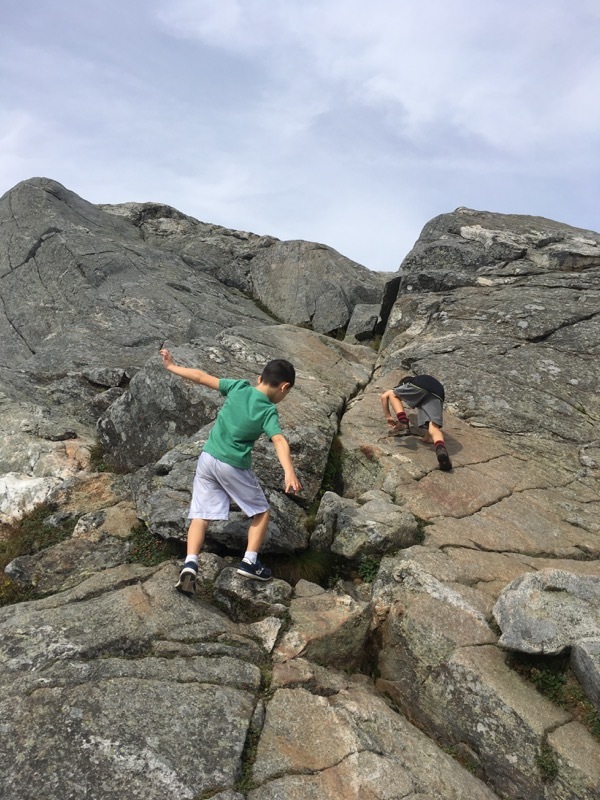 Its gray granite peak stands alone in southern New Hampshire – as there are barely even hills for miles around. 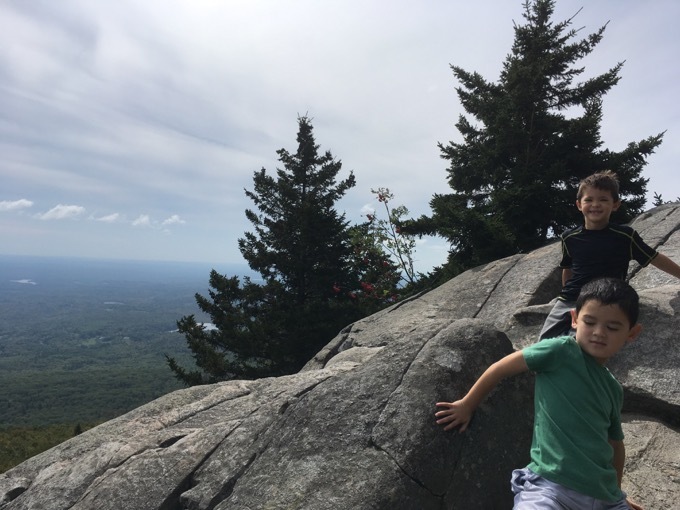 As we approached the state park in which it stands, the boys playfully brushed off the climb before them, but I caught Calvin’s wide-eyed gaze from the back seat. 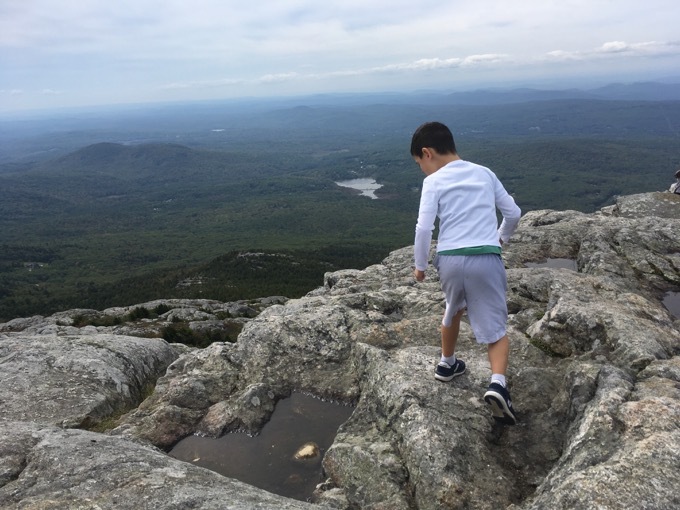 He really has no frame of reference regarding the effort he was about to undertake, but it didn’t matter; for his excitement outweighed any trepidation. 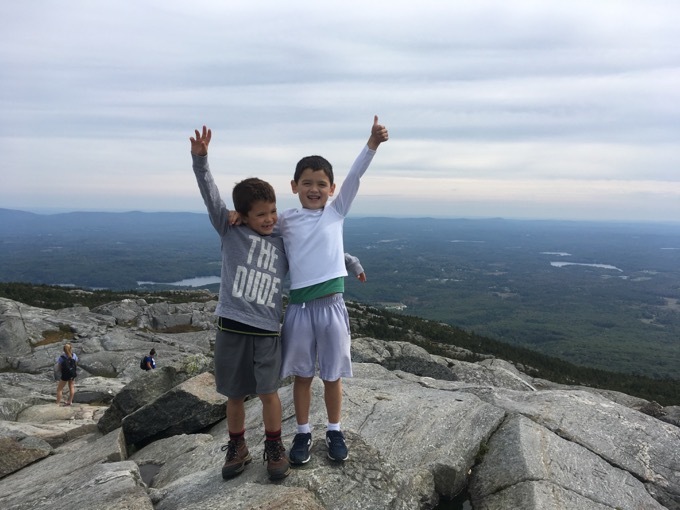 Sean and I made it clear to each other and to the boys: if the climb became too much for either of them, we’d turn around. As it turned out, there was never a moment’s thought of doing so. 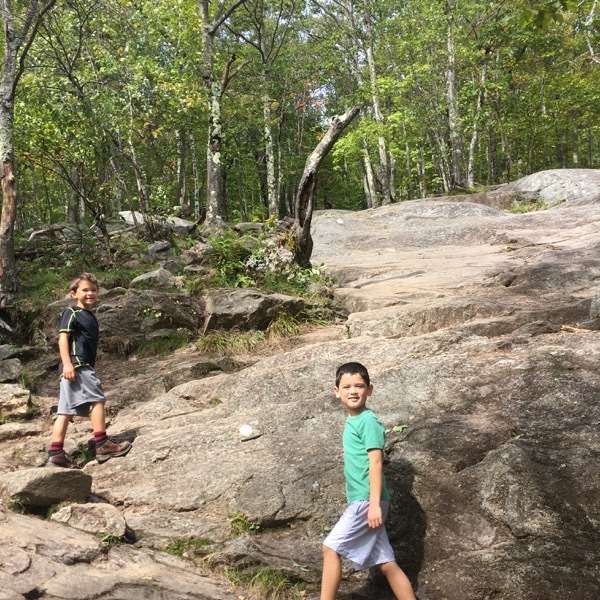 Once we climbed beyond the typical tall trees of the northern hardwood forest and began scaling the open granite rockfaces, Calvin and Owen were enamored. (Seriously, that’s a direct quote.) I love my son. He and Owen giddily wondered if we could see our houses. And Kentucky for some reason. 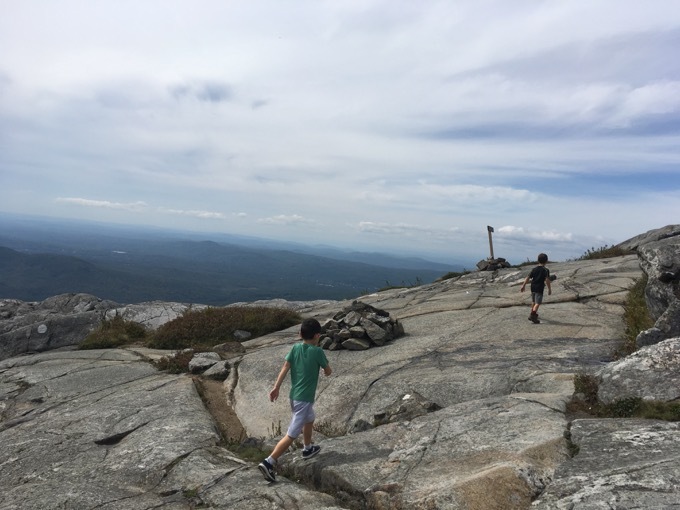 The top of Monadnock is “above treeline” because the trees were burned down twice about two centuries ago. In doing so, the thin layer of soil was blown away and trees could no longer gain a foothold. This sort of ruins the romance of the mountain, but hey, human foibles and science aren’t always romantic. 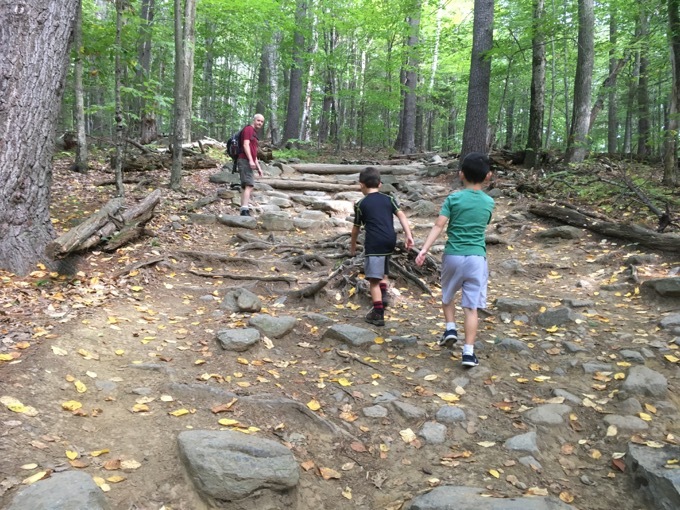 To see our six-year-olds scramble past able-bodied adults was… I don’t know. It was definitely cool and impossibly fun, but somehow it made me realize that I’m 44. We lunched at the summit with a smaller crowd then I’d anticipated. 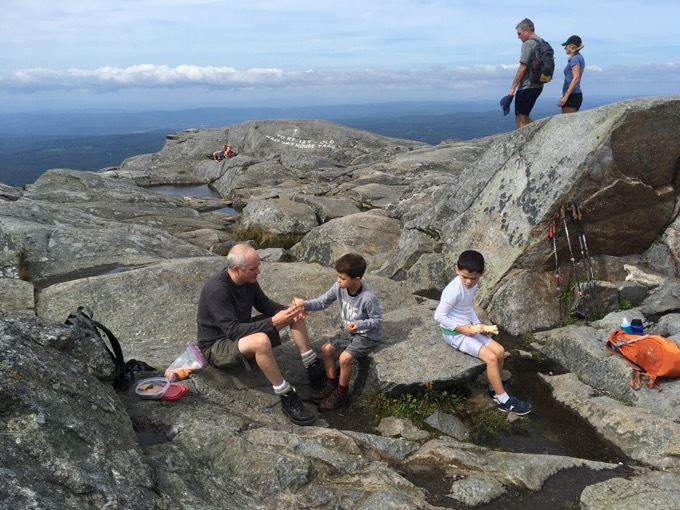 Monadnock is always cited as one of most climbed mountains in the world. 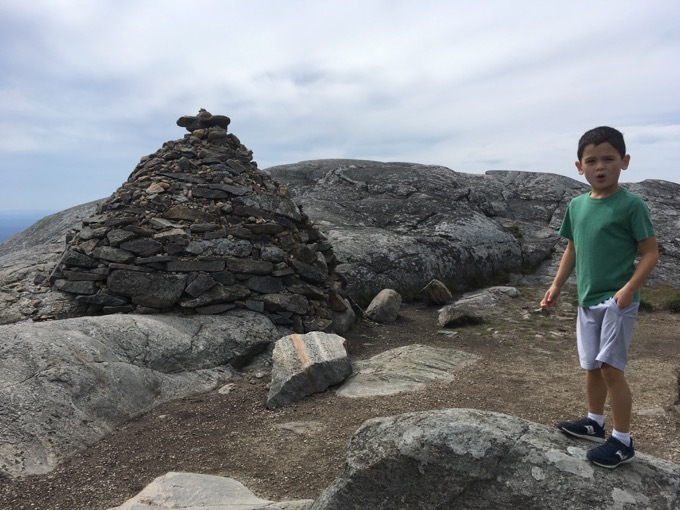 We were joined by maybe 25 others at the top, most of whom seemed thrilled that our sons were so entralled with the climb and the views. I was proud of Calvin and Owen and it was one of those rare times I could tell that Calvin knew what it was like to have accomplished something difficult. You see? 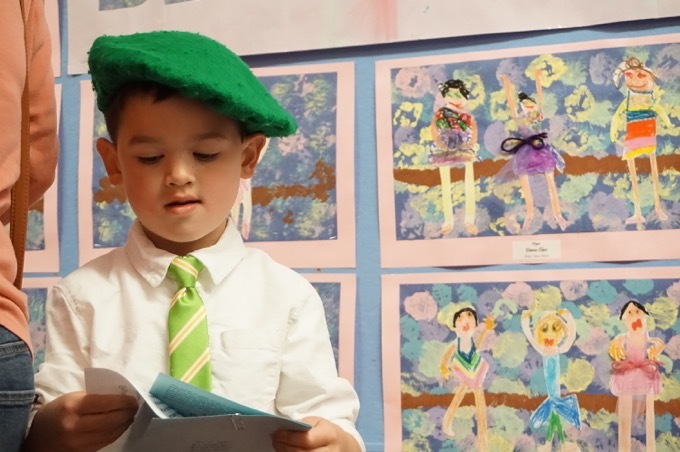 Kids can be pretty darn cool sometimes! Which, for the two women we passed by a few times on our ascent and descent, is a lesson I hope you learn someday. They seemed absolutely put-off by the kids for some reason. I heard them mutter something about wanting solitude and not a Romper Room. 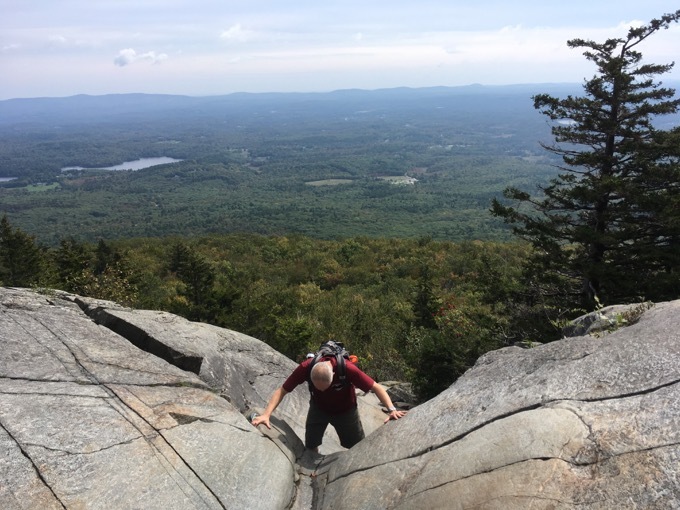 One, Monadnock is the last mountain anyone climbs in September for solitude. Two, the fact that they could not feel any of the joy and happiness in Calvin and Owen was infuriating to me. Our kids weren’t throwing rocks or shouting or splashing people or anything like that. I really wanted to have a conversation with them, but chose not to waste my energy. Anyway, both boys took a few tumbles on the way down. 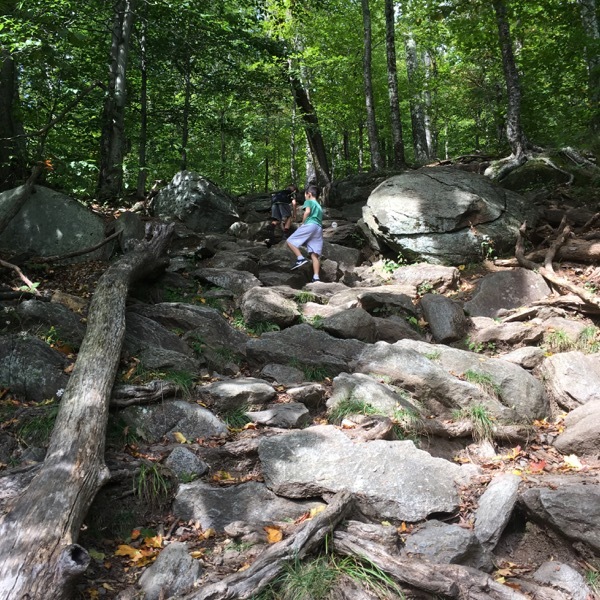 We took the slightly longer, those far less steep, White Cross Trail. Calvin got his feet wet, but beyond that, everything went as well as it possibly could have gone. 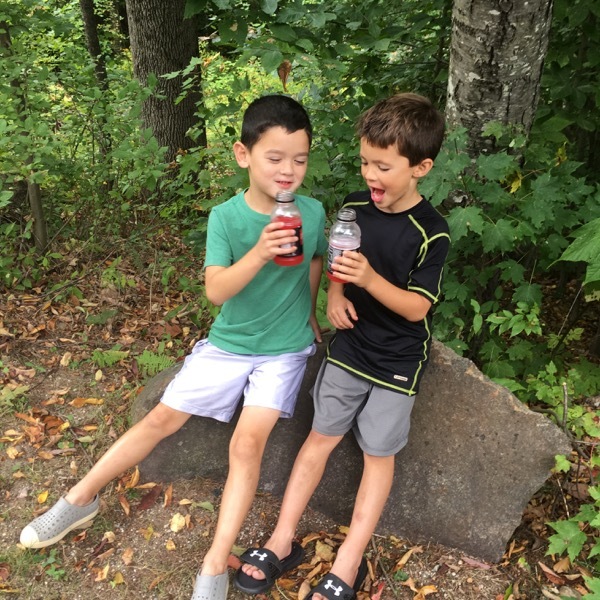 Once back to the car, they enjoyed a Powerade each (a treat for Calvin) and proceeded to run around playing football with an empty bottle. 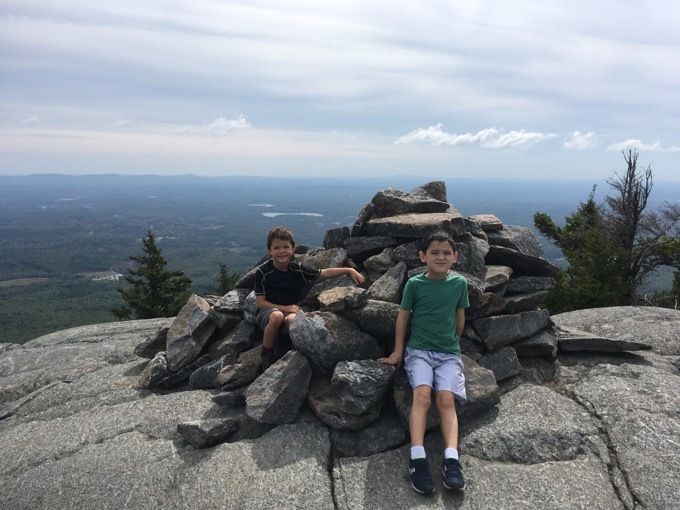 I had to smile as adults trickled into their lot and saw the two scamps running around as though they didn’t just climb up and down the same mountain. It was great. They weasled some ice cream out of Sean and we hit the road home. Shout out to our town for taking Jewish holidays off from school – they make perfect day trip opportunities! 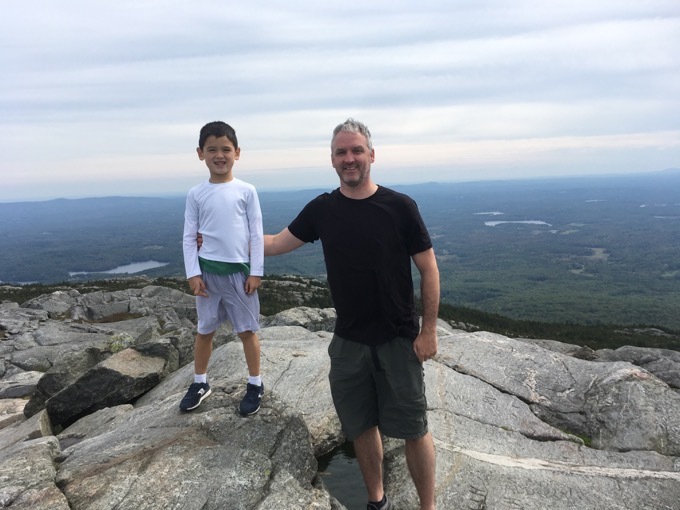 So here I am… reminded of the last book I gave away; Chasing Summits wherein the author never really did any hiking or climbing but his whole life changed with an ascent of Monadnock. I sort of poo-poo’d that idea… until I saw it happen with Calvin. Granted, a little kid’s whims can change with the day. But he was blown away by this hike! 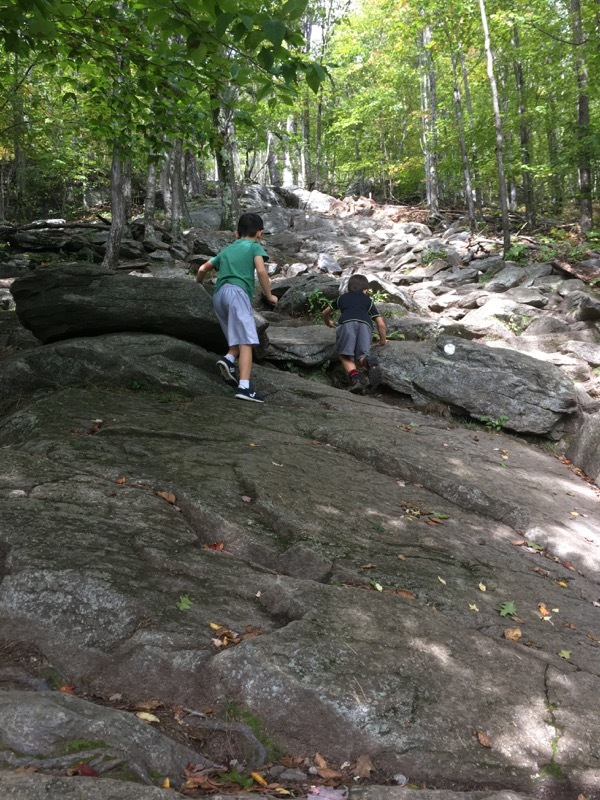 “I want to climb another mountain with giant rocks to climb over tomorrow!” said he. Not once, but for three days. I’m confident in saying he’ll remember this day for a long time. I showed him pictures of some of my exploits. I explained the concept of peakbagging to him. I told him there are tons of mountains to climb, many with exposed summits, but that they are all far away. He didn’t care. 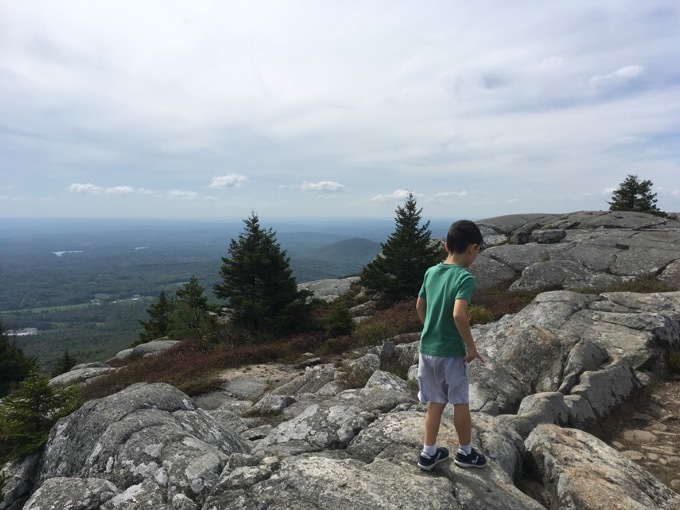 He’s ready to roll… and so am I. Monadnock appears on only one peakbagging list that I’m interested in: the 52 With a View list. Well done, boys, well done! Cheers! It’s also on the New England Fifty Finest list. 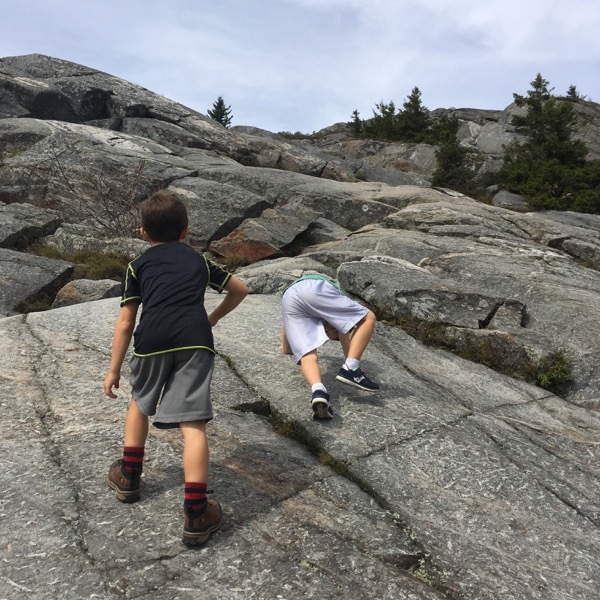 Concerning muttering hikers – reminds me of those who complain about babies crying in church. Henry D Thoreau wrote: “Heaven is under our feet as well as over our heads.” What better “Romper room” is there than nature? Kudos to all of you and congrats to Calvin and Owen. May nature always be your tonic. Why would you climb one of the most popular mountains in the world if you wanted solitude? 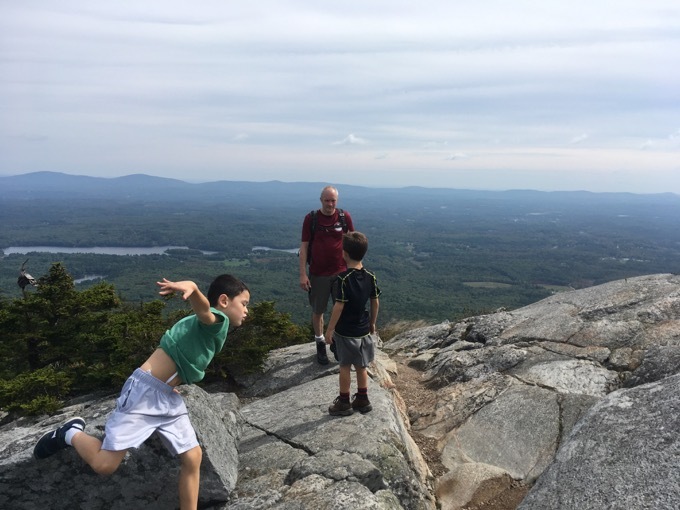 My father and I have climbed Monadnock several times, and it’s always a blast. If you’re able to go again on a crystal clear day, you can see from one end of Massachusetts (the towers of Boston) to the other (Mount Greylock).